Ismaili Centre and Museum In Toronto: Details are out - 2008-10-06 | Ismaili.NET - Heritage F.I.E.L.D. 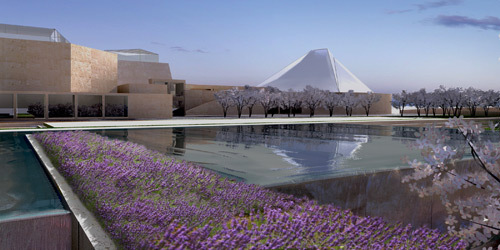 Development agencies for the Aga Khan recently announced details, which will include a pair of buildings on a 17-acre suburban site: a religious and community center by Correa and a new Islamic art museum by Maki. 2014, September 10:Toronto, Canada - H.H. The Aga Khan landed in Toronto this afternoon accompanied by his brother Prince Amyn. H.H. The Aga Khan was received at his landing by the Honourable Chris Alexander, Minister of Citizenship and Immigration. Plenty of museums around the world collect Islamic art—from ornate Persian carpets to Mughal miniature paintings—but there's never been a museum in North America focused solely on exhibiting these pieces, until now. One of the world’s great architecture patrons has hired two distinguished architects—the Indian Modernist Charles Correa and Pritzker Prize winner Fumihiko Maki—to design a $200-million cultural and religious complex in Toronto. Through The Leadership Of The Aga Khan, An Ambitious 17-Acre Redevelopment In Suburban Toronto Will Bring Two Global Cultural Institutions To Canada Supporting Art And Culture In The Ummah, Or Muslim Diaspora. ; As A Jury Member For The 2007 Aga Khan Award For Architecture, Architect And Professor Brigitte Shim Discusses The Importance Of This Unique Awards Program. Album for Wynford Park, housing the Toronto High Profile Jamatkhana and Aga Khan Museum.